I thought it would be of interest to post the stained glass the kids worked on last week when they took over my studio. My son worked out the design and bought the glass. They both cut and ground the pieces and layed them out. Jessica will do most of the foiling and Justin will return maybe in February so they can solder and put it all together. I can hardly wait. Well, I don’t know if I’m posting 2 days late or 1 day early. I have tried to regularly post on Sundays and Wednesdays and have been pretty much on schedule so far, but the holidays have a way of altering plans. We managed to have a white Christmas, but have had over 16″ of snow for the month – third most for recorded weather and more than enough for me. I guess I should be grateful that we didn’t get the east coast storm of the last few days. I finally got to photograph some of the artwork out in the sun right before Christmas . The snow melted back enough from the door to put out my photo stand and sun shone enough to take decent pictures. I still am not totally happy with the photos because the yellow facade is not quite right, but will keep at it and post what I have for my latest drawing. I like the picture more and more as time goes by. Sometimes, that is the way it is. I liked it but was not overwhelmed by the way the picture turned out, but I let it sit for a few days while our son and daughter took over my studio to work on a stained glass window to go over the front door entrance way. I made a few minor adjustments and am much more pleased. 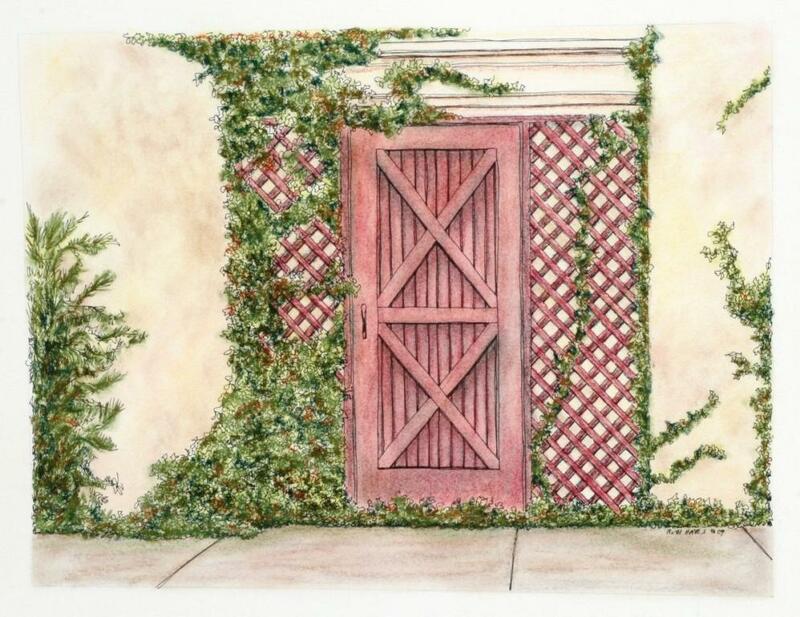 I used pen and ink and pastels, with a little bit of colored pencil. 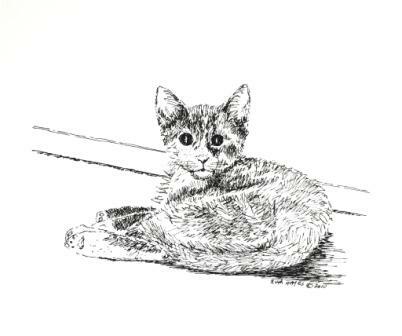 Here’s a link to an Etsy treasury with one of my cat drawings. Sarah picked out some beautiful white items and I am pleased that she liked my “Gizmo” drawing. 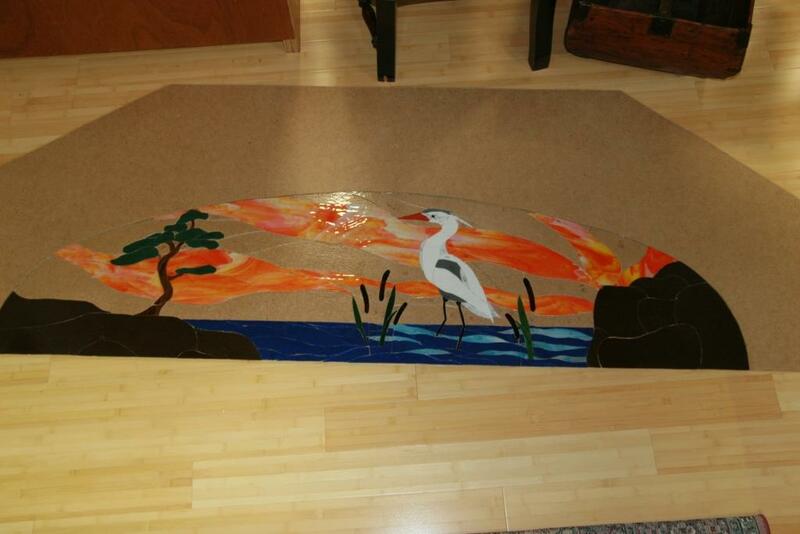 Tomorrow, after I have unloaded my camera I will also post a picture of the stained glass window the kids are working on. My studio was commandeered for the better part of the week, but it was worth it. The glass has all been cut out and next they will foil the pieces and then assemble it with lead solder. I can hardly wait for it to be finished and installed. The buck doesn’t stop here, but his girlfriends do. 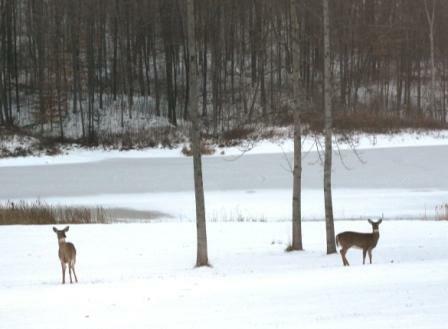 I was just starting supper tonight when my husband said there were deer out in the back yard. I hoped it was the buck but it was only two does. They came up to within 50 feet of the house, so I took my camera and put it up to the glass to minimize the glare of the flash. It worked well enough to do that. I lightened the picture some so the does could be seen more easily. Sometimes we have seen herds of a dozen or more. The wildlife has been somewhat scarce the last two months. Perhaps the cold and snow have them in hiding. They’ll probably appreciate better weather just as much as I will. And they don’t have to drive in it. I finished my latest drawing but want to try for better light for the photos. It has been so dark and bleak during the day lately and I really don’t want to take my artwork out in the snow. Ditto for the camera in the extreme cold. Maybe tomorrow. Wildlife on the pond ice. What could it be? 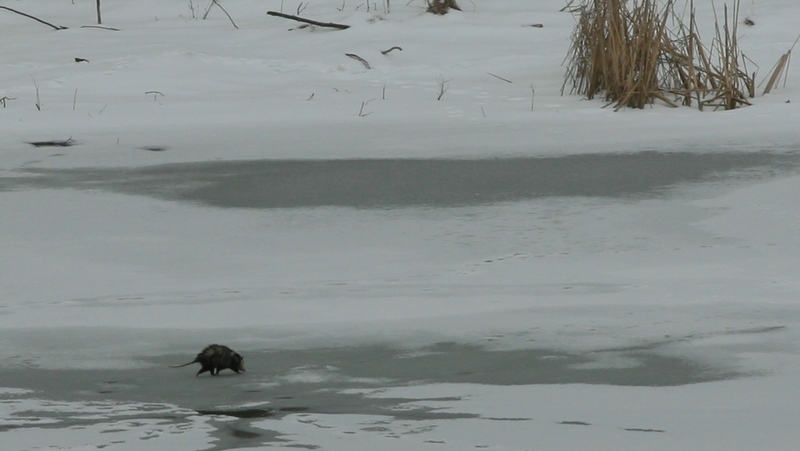 I looked out over the lake today and saw something of middlin size walking over the ice. We have seen minks here on the property and I was hoping to get a photo of one if that’s what it turned out to be. I got out my trusty binoculars to take a closer look and saw it was – a possum, a very large possum. It was disappointing not to see the mink, but this was one determined possum. I don’t know what he could be possibly looking for out in the middle of the ice, but he wandered around out there for quite a while and I got a picture of him with my telephoto lens. I’ve been keeping my camera handy in case the big buck comes by again but he is not being very cooperative. 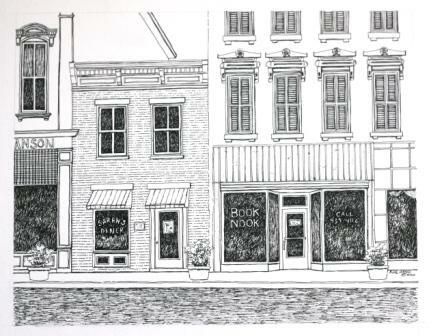 I have been working on an Indiana streetscape and it is going pretty well. I finished the inking and did a preliminary undercolor with pastel today. Tomorrow, given not too many errands, I will lay in some heavier color and see just what I have. Once again, they are predicting snow, but this time with a little ice added in. Remind me again why I should like winter. It has been so cold out that I haven’t been able to take pictures in the outside light. I am too afraid of getting condensation on the inside of the lens to try it. The change from drier high sixties indoor air to single digits or teens is more than I want to gamble on. I can’t really take them next to a window or door either because we have a little bit of tinting to keep out some of the uv rays over the summer and it alters the spectrum a little. Even so, I tried to take some photos next to the window and under my ott light and daylight flourescents. Guess which ones I ended up using. I really prefer to use my photo stand outside when I can. Mother Nature is NOT cooperating. I’ll just have to redo several things when the weather is more conducive. Anyway here is what I have been working on. 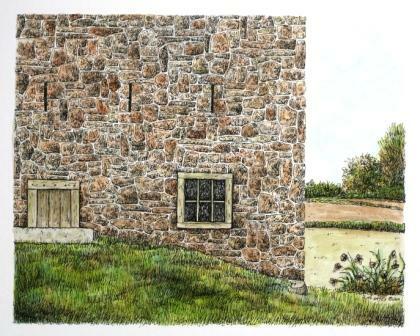 I did another of a stone barn that I like in pen and ink with watercolor overlay. I find the stone walls of the barn really appeal to me for some reason and I like to do one when I feel stuck. Here is a link to it in my etsy store. 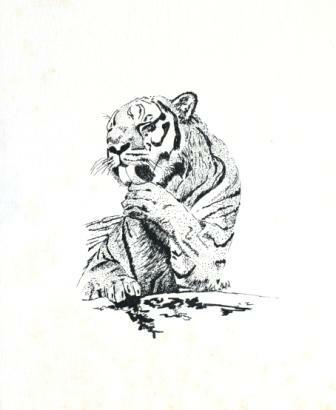 I also worked on a quick (relatively speaking) pen and ink of the cat we had when the kids were growing up. We affectionately called her crabby cat when she was all grown up, but here she is while still a kitten. It has all worked to get me back to more inspired work. I am already almost finished lining out my next project. I’ll probably list the Perkins picture in a day or two. Another snowy day here. It is only mid December and I am already tired of cold and snow. They are forecasting another big snow storm for Indiana today, but hopefully the worst will be far north of us. The old Farmer’s Almanac said a warmer than normal winter for us – I’m still waiting. I’m almost finished with my latest piece. 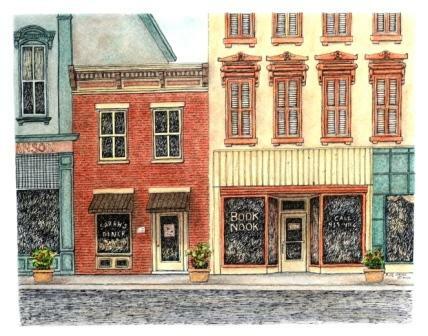 It is a pen and ink with mostly watercolor overlay and a little touch of colored pencil. It is in the let and sit phase now. I have found, over the years, that I need to take breaks during the creative process to let the art side of my brain clear. After I draw something out I need to let it sit for a day and then go back to it for inking. What looked fine the day before will often look distorted the next day. If I am working on drawing out something very complicated I get so bound up in it that I can’t really “see” it any more. After a few hours of drawing in the basic sketch, I get attached to the way it looks and can no longer judge it. I really need to clear out the image from my mind. Often it means just minor adjustments, but sometimes something is glaringly wrong and I get the chance to fix it before I ink. Ink is VERY unforgiving. I usually take a day or two for the inking on a small picture and maybe several more on something larger. I want to get into a flow, but not overdo it because once again I can get too attached to how it is proceeding. The same goes for the color overlay, whether I am using pastel, watercolor, colored pencil, or a combination of the above. It can take 3-7 days for a project to be completed. Not as long as it seems for the actual work , but because I need to have time to evaluate each stage as I go along. It is hard for me to be a stream of consciousness artist. The work flows when my brain is in gear, but I tend to get too attached to it without the breaks. Finally, when I think the color is done, I again let it sit for a day or two to see if it needs adjustment. The real difficulty is deciding that enough is enough and not to overwork it. I’ll post the work this week when I finish my last looks. I hope to have it up in my shop on Etsy by the end of the week. 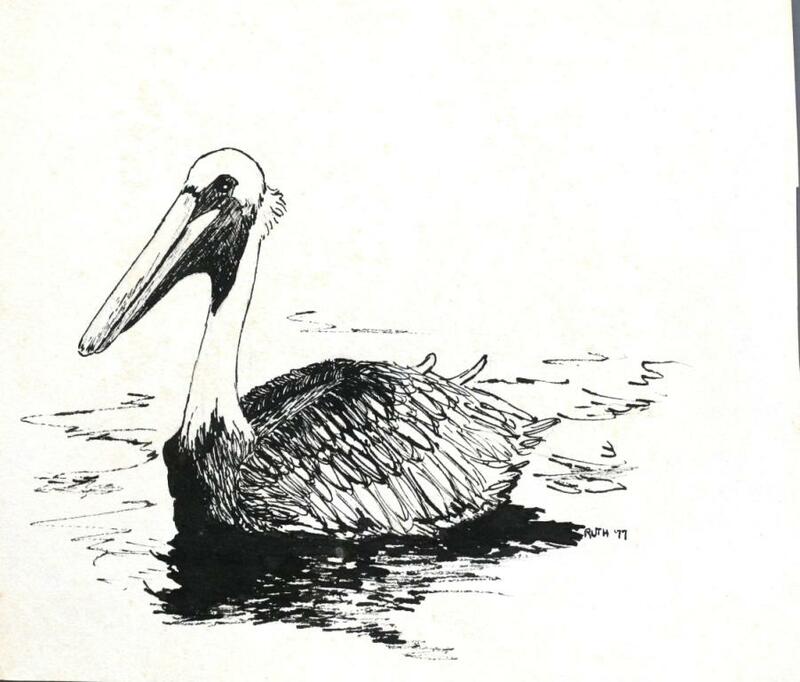 Today I’ll put up some of my animal art. I find alternating between the animal art and the architectural art is refreshing for me.